In order to meet customers’ requirement, Leizhan created an elite group, including professional engineers and experts,specialize in paper manufacturing turn-key design. On account of the 10t/d toilet paper production turn-key, Leizhan engineers have formulated the following design. In the first place, raw material will be conveyed into ZDS23 vertical hydrupulper for pulping by chain conveyor. After that, the paper pulp entered into ZSC2 high density cleaner, the heavy imputies in the paper pulp will be removed. Then, the paper pulp will be conveyed to inclined screen for screening the imputities in the paper pulp. 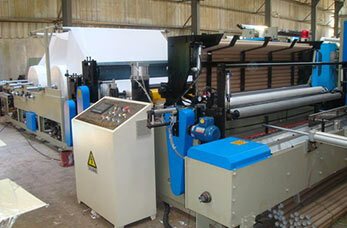 Thirdly, inclined screen will be used for screening the impurities in paper pulp. What’s more, the use of ZDP450 Double disc refiner can highly improve the beating degree of paper pulping. With a width of 3000mm, the paper making program can produce 10t tissue paper, using commodity wood pulp and white shavings as raw material. It has a basic weight of 13-30g/m2 and the design speed is 180m/min.